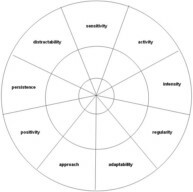 Activity: On The Temperament Wheel, is your child high or low? Low Activity – this child is laid back and content to watch others be active. Avoid criticizing your baby because he likes doing things more slowly than average. 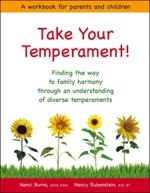 This will help your child feel comfortable with his approach to life. Find a few very active things she likes to do and support them. For example, take her swimming or swinging. Avoid having her sit quietly for long periods of time. Plan ahead to allow him the time he needs so he does not feel rushed. This lets him learn and do activities at his own pace. Anticipate your baby's next move and intervene when necessary to avoid a catastrophe. 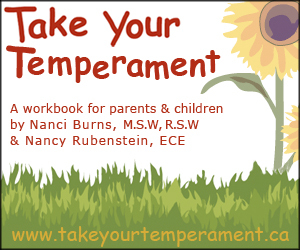 This helps your child learn what is permitted and what is not permitted BEFORE she gets into trouble. Provide lots of opportunities to help your baby burn off energy in safe, supervised sessions. This helps your child become more inclined to settle down when it's time to sleep, learn or play quietly. Provide a cool down period when it's time to switch to quiet time. 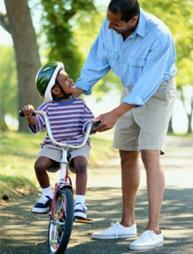 This helps your child learn how to transition successfully from high- to low-energy activities.